Students make hovercrafts from a balloon and a CD. This fun practical involves making a small hovercraft from a balloon, a drinks bottle top and an old CD. It may be used as part of a filler lesson or for investigations into friction. The sports cap is closed and glued into place on the CD over the hole. Super glue works best for this but for student use, sticky tape is probably a better option. Make sure the fit is tight so no air can escape around the cap. Blow up the balloon and fit the opening of the balloon over the sports cap. 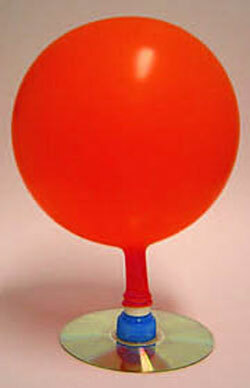 Place the hovercraft onto a flat clean surface and pop up the sports cap, keeping the balloon inflated and in place. 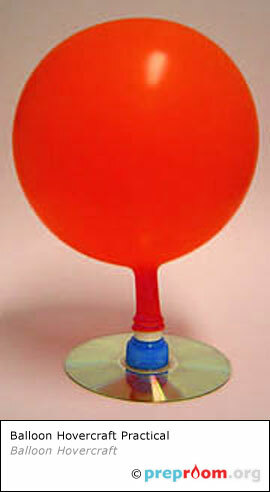 As air escapes from the balloon, it travels through the cap and out of the hole in the CD. As the hole is in the middle of the CD it allows the CD to sit balanced on a cushion of air. If the hovercraft is pushed as the balloon deflates, it should travel across the floor or worktop with little friction resistance. Your ICT department may have some old CDs that they may let you have. Others can be collected from magazines and internet companies who sometimes give out free trial CDs. If caught short, blank CD-ROMS can be purchased fairly cheaply from some high street retailers. The desk or floor needs to be as flat as possible for your hovercraft to glide smoothly over. Any dust or particles may bridge the gap between the surface and the CD, creating friction. The CD also needs to be clean and as smooth as possible. Unscratched CDs work best.